This is the chili that changed our minds about meatless chili! We absolutely LOVE this healthy vegetarian quinoa chili! Chop your peppers and onion and mince your garlic. Heat a tablespoon of oil in a Dutch oven or a large pot on medium-high heat. Add onions, peppers, and garlic and cook for about 5 minutes to tenderize the veggies. Next add crushed tomatoes, corn, chili beans, black beans, and spices; stir to mix. Reduce heat to medium-low and simmer, covered, for 25-30 minutes. While your chili simmers, rinse your quinoa. Add quinoa to a small pot with water or vegetable broth to boil [1.5 cups] and bring to a rolling boil. Once boiling, reduce heat to lowest setting and cover [with the lid propped open a bit to vent] for 12-13 minutes or until quinoa is fluffy. Fluff with a fork and add to the pot of chili. Total cook time for the chili will be about 25-30 minutes but feel free to leave it simmering on the stove for a little longer, on the lowest setting, if desired to mingle the flavors even further. Scoop out a bowlful, pile on the toppings, sit back, and enjoy! Feel free to adjust the consistency of the chili to your liking. As written it's perfectly thick and full of delicious texture, but can be thinned with a little broth or tomato sauce if desired! If you add a lot of extra liquid, consider amping up the spices a smidge to compensate. You can also make this vegetarian chili as mild or as spicy as you'd like! I hope you love this chili as much as we do! I topped mine with freshly grated cheddar, avocado sprinkled with a dash of smoked paprika, fresh parsley, and a dollop of Greek yogurt. Delish! 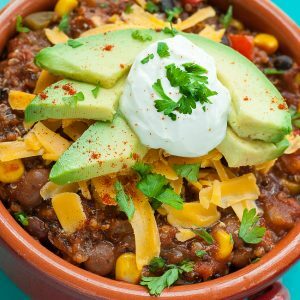 Top the chili with all your favorites for a tasty custom dish! Nutrition facts below are an estimate provided by an online nutrition calculator. Choose your favorite toppings and adjust as needed.